NBC 5 Investigates has learned several K-9 teams at Dallas/Fort Worth International Airport and Dallas Love Field Airport failed important certification tests that check how accurately they can detect explosives, calling into question whether those teams are training enough to stay at the top of their game and keep passengers safe. The mission of explosive detection K-9 teams is to keep bombs out of airports and off planes by screening baggage, cargo and passengers for potential threats. New records obtained through a Freedom of Information Act request raise questions about the top dogs at some of the nation’s biggest airports. The records show K-9 teams funded by the Transportation Security Administration have failed annual certification tests at large U.S. airports, including D/FW Airport and Love Field, more than 50 times between Jan. 1, 2013, and June 15, 2015, the most recent detailed numbers TSA provided. Some teams failed to find explosives, while others had too many false alarms that could cause unnecessary airport evacuations. K-9 teams that fail are pulled out of service and cannot work in airports again until they can pass the test, but experts NBC 5 Investigates spoke with say clusters of failures at some airports raise concerns about how well those teams are being managed. The TSA said the failures are just a normal part of upholding high standards. But multiple failures at D/FW Airport and Love Field raise questions about whether those teams have been training enough to maintain the highest level of readiness. “The team must successfully meet certification standards before returning to search duties. Dog teams that are unable to return to TSA’s high standards are subject to removal,” the TSA said. The agency said teams performed better in the latter half of 2015 – with a 93-percent passing rate nationwide. But the agency would not share any detailed records for that time period or for 2016, so it’s unknown if there are still some airports with clusters of failures. “We rely on K-9 teams a lot more now than we ever have in the history of aviation security,” said airport security consultant Jeffrey Price. Price said the lives of passengers depend on how well the dog teams perform. “Dogs have always been considered the gold standard in explosive detection. So when you’re considered the best, you better be the best,” said Price. At Love Field, K-9 teams assigned to protect the airport failed four out of 14 tests with a failure rate of nearly 30 percent over two-and-a-half years. In 48 tests over the same time period, teams at D/FW Airport failed five times, or 10 percent of the time. The nation’s busiest airport, Hartsfield-Jackson Atlanta International Airport, did better than those in Dallas with only two failures in 75 tests (3 percent) over the same two-and-a-half year time period. 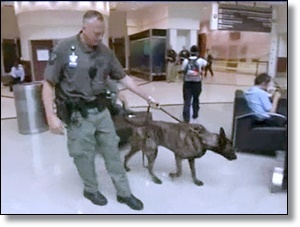 All K-9s managed by the Atlanta Police Department passed while two TSA managed teams failed. To better understand why more K-9 teams failed at airports like Love Field and D/FW Airport, NBC 5 Investigates went to Alabama to one of the nation’s top K-9 training centers at Auburn University and AMK9. AMK9 works with the university training dogs in explosive detection for agencies across the country. “You need to convince that dog that there’s a reason to work,” said John Pearce, who used to help oversee training for the TSA. Pearce said the main reason some dogs fail certification tests is the people in charge of those K-9 units don’t always set aside enough time for constant training. He sees a direct relationship between the quality of the training and the success the dogs have on tests. “Our primary job is to find an explosive, as a dog team, but that dog believes its primary objective is to get that toy that’s in the handler’s pouch,” said Pearce. In airports, dogs rarely find explosives, so unless they practice locating test explosives frequently, they may lose interest. In addition, handlers also need constant practice to accurately recognize the dog’s cues. Pearce said handlers need to train daily. “Train, train, train and train as you’re going to work,” said Pearce. NBC 5 Investigates wanted to know if the people in charge of the K-9s at Love Field and D/FW Airport are spending enough time training. Some of the teams are managed directly by the TSA, but many are run by D/FW Airport police and Dallas police that get their dogs, training and funding from the TSA. Dallas police declined an on-camera interview and would not answer any questions about their teams at Love Field. Since then, the TSA has made changes, including a new program starting Oct. 1 to hold local airport police departments more accountable for training and to enforce higher training standards. With multiple failures at airports including D/FW Airport and Love Field make some experts wonder if supervision and training is needed in a business where there may not be a second chance. 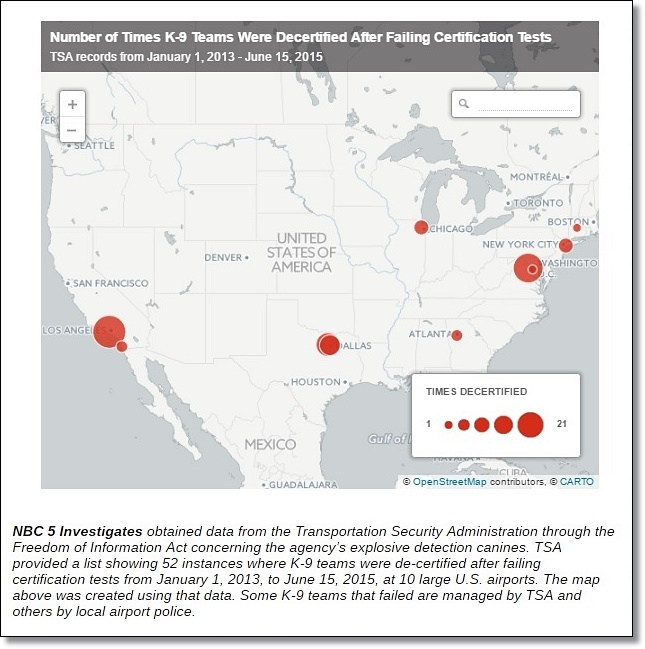 The TSA’s records have shown nearly a dozen teams failed at Washington Dulles International Airport and more than 20 at Los Angeles International Airport from January 2013 to June 2015. NBC 5 Investigates will be on NBC’s Today Show Thursday morning with the national part of the report and on NBC 5 News at 6 p.m. with what other major airports are doing to pass tests and make sure their teams are ready.